Photo series by Catherine Schieve, from an earlier Strong Tower service in 2015. Strong Tower Assembly is a community of the Redeemed Christian Church of God (RCCG) meeting in Kensington, an inner suburb of Melbourne, Australia. The RCCG has its origins in Nigeria, and is widely-known for its rapid growth in other contexts, notably Britain (my own culture of origin) where it now has over 800 assemblies, and where the Jesus House for All Nations, a church-planted in 1985 with just four people, is now the fastest growing church in the U.K.
Strong Tower in Kensington is one of several RCCG congregations in Melbourne, and was started in 2011. On the day of my visit in February 2017, just under one hundred people gathered for worship in a premises on an otherwise quiet industrial estate near flyovers and train-lines in north-west inner Melbourne. Commuters on passing trains might spot the Redeemed Christian Church of God’s branding on the building, but it is tucked in alongside catering company amd other warehouses. Otherwise worshippers would need to know how to find this somewhat remote meeting place in a non-residential area. Under the large RCCG sign on the upper front face of the building, a smaller sign on the entrance door identifies it as “Strong Tower Assembly Melbourne,” a logo that also sports the otherwise clear perspex ambo which is the central point of focus in the interior of the space. The windowless, box-like, assembly room could seat considerably more than were present on the morning of my visit, with comfortable padded chairs facing forward in aisles. At the front is a raised area, with central ambo, and behind it two drum sets (one a large cluster of bongos), a bass guitar on a stand, and a line of microphones along the back wall. Two keyboards are situated at the foot of the steps, where the large band as it were spills off the stage. The (front) back wall itself houses a giant digital screen which is used to show close-ups of those leading prayer and the preacher, sometimes for words of songs of praise, and for Bible verses referred to by the leaders. The stage is illumined by stage lights, which change to flood the focal space in pools of intense colour, while the seating area for the assembly is lit brightly by overhead strip-lights. The walls around the large room are adorned with cut-out shapes (mainly doves, perhaps as a dove features in the RCCG’s official logo) onto which Bible verses have been printed, as well as large professionally produced posters for the RCCG/Strong Tower, each showing a multicultural mix of mainly young people. The make-up of the Strong Tower assembly on this February morning was, however, almost exclusively African; apparently mainly Nigerian (indeed, from each of the main ethnic groups: Housa, Ibo and Yoruba) but with a significant proportion of others from Somalia and other East African nations. One person presented as having Indian Subcontinental heritage, and, it transpired during the pastor’s request for first-time attendees to identify themselves, he was new, like me, the only white person in the room. The age range of the assembly was mixed, from numerous babes in arms to a few seasoned citizens, but heavily weighted towards the young. The majority were young adults; it transpired later in conversation that a number were students at Melbourne’s various universities, and groups of young men and young women tended to sit together in friendship groups. Other young people present were identified as the children of economic migrants, whose parents had settled in Australia some time ago—with the parents themselves constituting the majority of the older members. Some members of the assembly had arrived in Australia on humanitarian visas, as refugees. A few older women wore hats, and some younger women, like their elders, wore clothing with bold “African prints.” Many older men wore business suits, and the younger people, women and men, tended to sport a very “smart casual” style. While the raised stage area with central ambo was the clear focus of the room, the assembly itself was not passive as it occupied the main floor. A notable amount of talking (chatting to those around) went on whilst the preacher and others spoke from the front, though call-and-response was a strong feature of the sermon and other talks by leaders, and these repeatedly drew the assembly into one voice. A particularly well-used refrain was the affirmation of “the mighty name of Jesus,” which drew loud “Amen”’s, with this call-and-response sometimes being used rapidly in sequence, each time more loudly and vigorously. Some members of the assembly held Bibles open during the main and other addresses, and apart from the envelopes which were distributed for tithes and offerings (which were the only thing given into people’s hands), Bibles were the only hand-held books or papers among the assembly members. When the people sang, swaying, hand-raising and arm–waving, and dancing, more or less strenuously, took place. These various embodied modes of participation appeared free and un-choreographed, often accompanied by closed eyes, and with demonstrable emotion manifest upon worshippers’ faces. Much of the service would not be unfamiliar to those accustomed to Pentecostal worship, though whilst there were various leaders across the different parts of the service, and the congregation was active “in the pews,” there was less vocal participation in “open” times for assembly-members to offer prophecy, interpretation, and use “spiritual gifts” as there might be in many forms of classic Pentecostalism. The emphasis on the leader’s role, especially with stage area and performance aspect of the musicians, perhaps reflected some influence of neo-Pentecostalism (perhaps like Hillsong, whose music was at one point sung). This genre has been criticised by some commentators for embracing a movement “from folk to fan” (see Pete Ward, Selling Worship [Carlisle: Paternoster, 2005]) in that it has increasingly led to less “folk” participation in Pentecostal/charismatic worship and more emphasis on professional performance, with congregations—the folk—almost positioned as “fans” to star-status celebrity leaders. However. With respect to the music, the active, singing, dancing, assembly at Strong Tower might contest or at least temper this critique, as might the large team of very gifted musicians each yielding leadership to the other as they contributed to the music-making, and also notably arising from the assembly to take their lead rather than being separated throughout by, say, the height of the stage. Like classic Pentecostalism, women had major roles in leadership of the service, with one (the pastor’s wife) leading an extended extempore meditation on a portion of 1 Samuel 15, her point of emphasis being a call to “surrender,” to “trust the commandments of the Lord, and not substitute them for our own understanding or excuses to obey” God. Another women led a sequence of prayer, exhortation and extempore song relating to the offering, an element of the service which I later learned had been moved from the end of the service where it had long been positioned to nearer the middle, where it was this day, because people working shifts would sometimes leave before the end and therefore before the opportunity to commit their tithe. 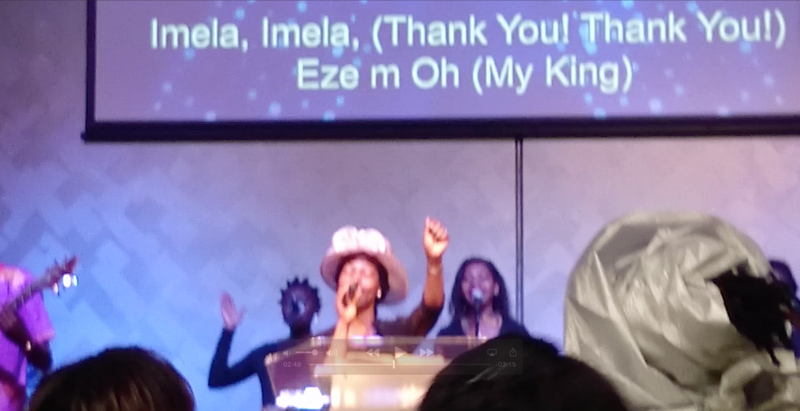 Both of these women leaders were among those who wore hats, though other women in the singing band at the front did not. While the male pastor offered the main sermon on this day, I was informed that such a role is not reserved to men, and indeed sometimes the pastor’s wife (sic) preached, just as on some days there may be no sermon at all, with priority on those non-preaching days being given to an extended time of praise and thanksgiving. It should be noted, however, that as notices during the service revealed, there were various opportunities for Bible study through the week, around the city in members’ homes on Tuesday evenings, and at church for an hour before the service every Sunday, with a special Bible study also put on for youth after worship. I was told that, to the chagrin of some members, the Bible study before worship was so ingrained it took place even on Christmas Day, when some members at least felt it unnecessary given the day of celebration. In addition to these opportunities for Bible study outside the service, various gatherings for prayer, at least every Wednesday and Friday, were also announced, as were upcoming special events for “divine encounter,” as well as encouragement of participation in the current season of personal prayer and fasting between midnight and 6 p.m. each day. Although the service I attended was focused on the word, and no mention was made of holy communion, I was later informed that this took place once a month on Sunday mornings. Towards the end of the pastor’s more than half-hour long address, a keyboardist returned to his instrument and began to play as the pastor spoke. Through the address, the call-and-response” triggered by the phrase “in the mighty name of Jesus” had been repeated many times, and the sermon closed with the pastor calling the assembly to its feet for a song of praise, the Hillsong “Mighty to Save.” It was notable that only during the main part of the pastor’s address did music stop playing. At least a keyboard had played throughout the rest of the time, always between songs, “under” prayer and exhortation and throughout the pastor’s wife earlier talk. This music on keyboard was extemporised, jazz-like, with the various leading voices, becoming more excited as voices raised, slowing and stilling as voices hushed. It was deeply attentive to “mood” and this interactive dimension of sound was a major role of music throughout much of the worship, quite apart from shaping the voices through the songs that where sung. Each song was led by a particular singer, with different members of the band taking turns to do so, and the songs were in a range of styles from a variety of sources despite having a similar high-energy level. One song was a contemporary and lively rendition of Fanny Crosby’s “Draw me nearer, blessed Lord,” from the late nineteenth-century hymnbook Sacred Songs and Solos, during which the song-leader led extempore prayer between the congregational singing. The words of this hymn were the only song words to be projected onto the screen, with others perhaps presumed to be known by heart or easily able to be picked up because, akin to the sermon, they used call-and-response, though with song involving the congregation repeating, line-by-line, words sung by the leader. The on-screen words for the hymn were given in both English and Arabic, the latter perhaps reflecting the presence of persons from coast-to-coast across North Africa, including lands beyond English-speaking colonial histories. The closing song “Mighty to Save” was, like the majority of others, sung without words being given. Its strong chorus echoed the much-repeated reference to “the mighty name of Jesus” in preaching and prayer but curiously it was this final song that included the first concrete reference in the service to anything that Jesus, according to the gospels, did: “you rose from the grave.” To this participant, this reference at the end of the service served to highlight how the bulk of the service itself had emphasised “God” or “the Bible” but aside from the refrain about Jesus’ mighty name had made little explicit reference to Jesus, and whilst conveying great confidence in what his mighty name might now do—not least, lift us up—had not much elaborated on what, according to the gospels, Jesus did do. Other song had a more distinctly African “feel” to it, and sometimes included Nigerian dialect. 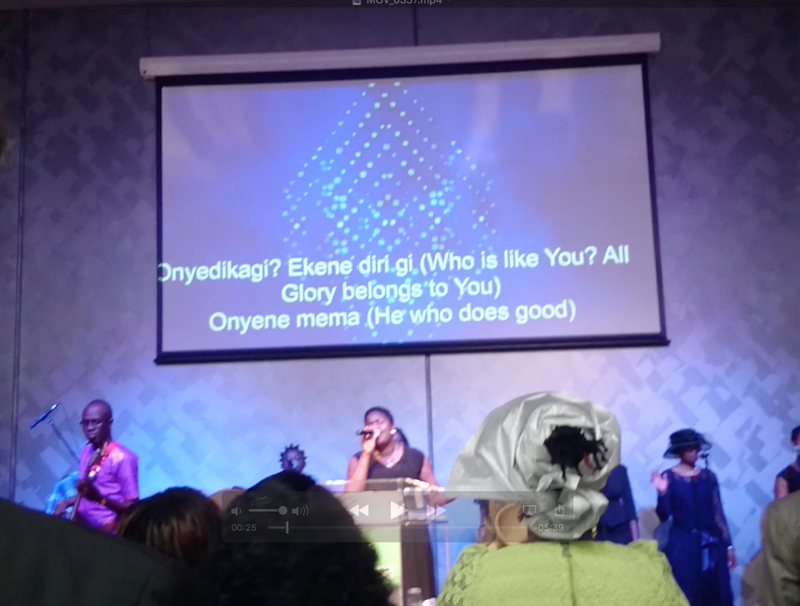 This was particularly notable during song in tandem with prayer for particular persons called out of the congregation. 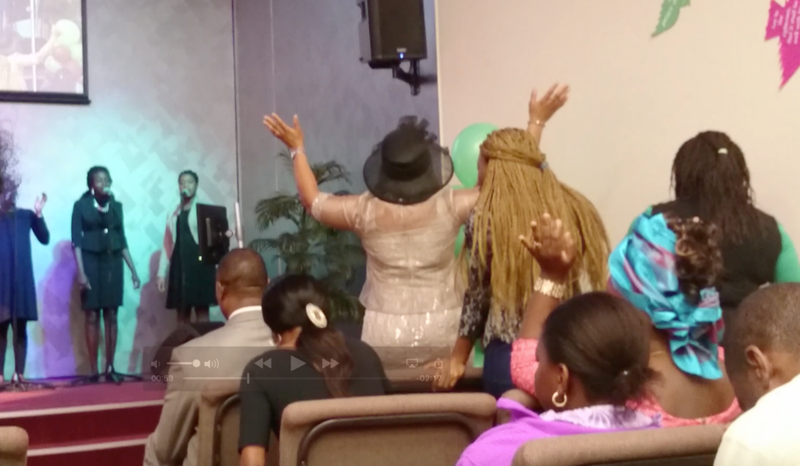 One woman, about to travel to Nigeria to be married, was called forward while the assembly prayed for her, many hands aloft towards her as the pastor voiced intercession for a faithful and fruitful marriage. Later, a couple, recently married, were called out while the pastor led prayer for them, but only after the couple sang and danced together at the foot of the stage. The song was led by the new husband, and he sang in what I was informed was his local Nigerian dialect, to which the congregation occasionally joined in refrains of “alleluia.” During the song, the newlyweds gazed suggestively at each other, gyrating their bodies, while the man sang to his wife with his hand on his hips, behind his head and from time to time waving in front of his groin. Given that the song was in a Nigerian language, the words were lost to this visitor’s ears, but the ways in which the song was embodied by both husband and and wife lent it evidently sexual dimensions. The song openly conveyed joy in love, albeit within perhaps prescribed boundaries. Whatever other members of the congregation understood of the words of this song, they seemed to look on it with smiles and some laughter, and indeed laughter was mentioned many times in the service. Psalm 126, to which the pastor at one point made reference in his sermon, provided a kind of inclusio for the worship, its images of mouths open with laughter and tongues freed for praise being alluded to at both the opening and close of worship as well as at various points throughout—notably with reference to the offering of tithes. Indeed, “make us laugh, Lord” was one of the things invited as gifts of money were dedicated. Throughout the assembly’s gathering there was apparent confidence in the extempore encouragement boomed by a leader near the start, “the God we worship is not deaf,” and in various ways the worship of the Strong Tower Assembly engaged the senses. From the perspective of one schooled in western liturgical worship, it was refreshingly conscious of the body. RCCG Preaching: In the Name of Jesus! 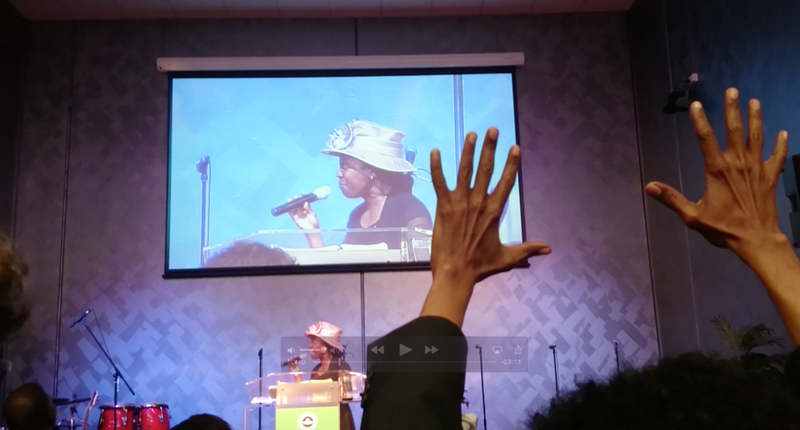 Redeemed Church of God - Nigerian Church in Kensington, VIC Australia - "In the Name of Jesus" - female Pastor - preaching, speaking in tongues. This occasion was a special service honoring women. Recorded by Catherine Schieve in 2015.